The short answer is: real estate leads are business. It’s as simple as that. Generating real estate leads for someone with a real estate business is no different than generating consistent business sales for a store. If you don’t get leads, you won’t get deals. And if you don’t get deals, you won’t get a profit. I understand the difficulty in generating real estate leads if you’re starting out. It can be a difficult and frustrating process tracking down leads, or even just getting your name out there. But, I also know a few tips to help you figure out how to generate real estate leads. In our previous blogs, we talked about take-off strategies for your website, building a wholesale buyers list, and why you aren’t getting deals from your real estate website. Those blogs all have ways to generate real estate leads, but we’ll get into more detail with those tips in this blog. After all, real estate leads are business. You can’t just start to generate real estate leads from thin air, you need to know who your target is and what they’re looking for. There are different types of real estate investing, and it is important to determine what kind of lead you’re turning into a deal. For instance, there is a noticeable difference in demands for a flipping house versus a wholesale house. A house bought to be flipped is going to have different needs than a house bought for wholesaling. A flipped house will cost you investments directly into the rehabbing of the home, whereas a wholesale house is bought from the seller and sold to an investor. The costs going in are different, making the type of lead different. You need to know what you’re going up against before anything can be done. Determining what kind of real estate lead you’re looking at will help you to determine if it’s a viable lead, and potential deal, or not. Identifying your target will help your real estate business. Having brand recognition is important for leads to identify your real estate business and services. Building your brand isn’t as daunting as people tend to think. If you start with your business name, or your website’s domain name, and form a logo that has to do with it. Look at brands you recognize as examples: McDonald’s took the “M” from their name and turned it into the iconic golden arches. Your logo can be simple, like a letter or a shape, or it can be abstract like the Chase Bank logo. Whatever the logo you make, it is important to stay consistent with your branding. On any content or product you make, be sure to add your brand. Your brand name and logo should be simple, recognizable, and on as many things as possible. Put it on your website, in your emails, on your social medias, print it on t-shirts, put it on your business cards. Your brand is your real estate business’ face, it is important to get is exposed. Remember, exposure is the top way to generate real estate leads for your business. Getting exposure for your business will help you to generate real estate leads. The best ways to start getting traction for your business is by having a real estate website. Because the majority of people’s time is spent on the internet, 40% of the entire world uses the internet daily, it only makes sense to have a website. The benefits of having your own real estate website are limitless. The internet is one of the best ways to market yourself. From SEO (Search Engine Optimization), to social media marketing, to email campaigns, getting exposure on the internet is not only effective, but simple. In a 2015 study on online marketing, Hubspot found that “online content marketing generates more leads than traditional outbound marketing, and costs 62%less”. With information like that, why aren’t you already doing online marketing. This is the age of technology, simply passing out flyers promoting your real estate business won’t cut it when it comes to generating leads. While the internet is the top way of getting your business exposure, never underestimate the power of shaking someone’s hand. According to RightNow, an online customer service representative service, 73% of customers will “fall in love with a brand” if there is a positive interaction between a representative and a client. Remember, you are a brand and anyone you meet is a potential client. Always be personable. By going to local REIAs (Real Estate Investment Associations), you have the opportunity to network in person and hand out your business card. Building a strong network of other local investors will help you to generate real estate leads by having open communication lines with others who are in the business. If one of them finds a lead outside of their area, but in yours, they will be more open to communicating with you if you have met in person. Being personable is key to networking, and doing business. If others know that there’s a real person behind the business, they will be more inclined to do business with you. 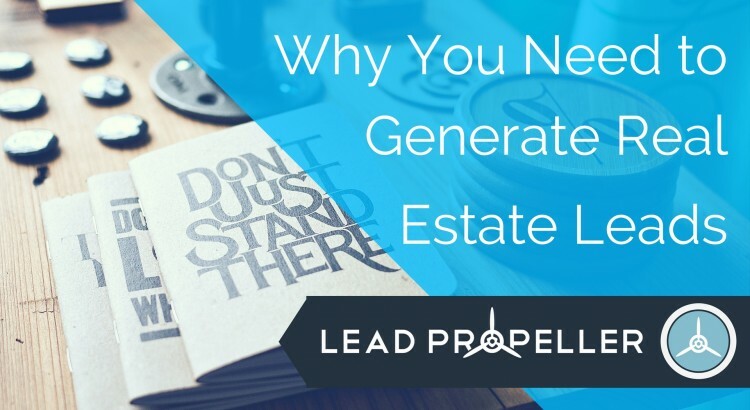 So in the end, how to generate real estate leads isn’t as difficult or frustrating as you might have thought. As long as you keep in mind that getting leads is getting business, you can’t go wrong. You need leads to convert to deals in order to keep your business alive. To generate real estate leads, all you need to do is follow these guidelines. By getting exposure for your business, doing business in person, branding, and identifying the type of lead, your real estate business should be seeing action in no time. Just keep your head up, and don’t forget that leads are deals, and deals are business. Now, go generate leads!